Illuminations is in transition. In order to better serve our customers, Bright Ideas Press has decided to sunset the scheduling software and instead focus on better ways to deliver the rich content of Illuminations' schedules and lesson plans.​ Illuminations scheduling software will remain available for purchase up through 9/1/18, however the software will not receive any further updates and we may be limited in providing technical support. Illuminations is a practical, comprehensive, customizable homeschool curriculum guide with a Christian worldview. Each year of Illuminations contains lesson plans, guides, and reading schedules for grades 3–12. If you have younger children, they can join in with the older students thanks to the additional teaching ideas for grades K–2. In Illuminations we've chosen curriculum that you can pick up and use without a lot of advance preparation. Purchase the novels, textbooks, and resources on our book lists, and all of the planning for the entire year is done for you! Use our Illuminations Build-A-Bundle Tool to make purchasing even easier. As you can see in the video below, the weekly scheduler is completely customizable. Whether you want to tweak the lessons provided, use a different curriculum from what we suggest, change or move the assignments, add in your own math program, or even include a chore chart or meal plan, the unique schedule grid of Illuminations keeps all of your plans in one place. The weekly schedule provides a concise overview of assignments for each subject; the lesson plans provide details. While high school students are scheduled for five days per week, the lesson plans for grades 3–8 have four-day schedules to provide a day for field trips, supplemental studies, or just catching up. Our literature guides help you savor the very best historical fiction and classics for each time period. They include discussion questions and activities for all learning styles. You can find a list of required items at the beginning of each guide so you can prepare everything you need ahead of time. Illuminations also provides a collection of hand-crafted graphic organizers and a handy literature evaluation form to grade students' work. Each segment shares the same history plan, which binds them all together, but has a unique literature plan and curriculum choices that are appropriate for that age range. This feature of Illuminations makes multi-level teaching simple for you and memorable for the students as they study shared topics while still having age-appropriate assignments and hands-on activities. Illuminations is a downloadable curriculum that you can use with as many of your children as you would like -- at the same time or over many years. Software updates are included in your purchase for as long as you own Illuminations. For each student, you simply purchase the resources from the book list that you want to use. For co-op usage, please contact us for information. Amazing things can happen when kids who don’t like to write, are afraid to write, or don’t know how to write are given a program that works! Foundation to Writing is a no-stress approach. For the first 18 weeks or more, the student doesn’t even write! To teach writing, you can’t start with actual writing. Because writing is a developmental skill, there is an entire foundation that needs to be laid before we can ask students to write sentences and paragraphs, let alone a research report! 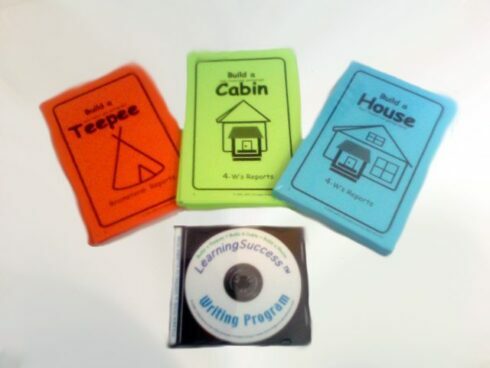 Foundations to Writing is a program designed specifically for use in Illuminations, and is based on LearningSuccess Writing Program by Victoria Kindle Hodson, M.A. and Mariaemma Willis, M.S.